GLY is a contractor that does a lot of work for Microsoft and thought we would be able to help with some issues in the building office spaces. They�have had some concerns about the privacy factor, also�another issue -�no whiteboards for brain storming, meeting notes, ETC. We thought it best to do a site review so we could discuss more concrete objectives and to�see surrounding decor in order to provide a perfect solution for the tenant. 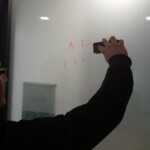 First thought was 3M dusted crystal�(which we have used on several jobs at Microsoft) but this would not�solve the whiteboard problem, next thought�”lets�use a Whiteboard film, This would solve both problems.” However they have had�that installed before and were not sure it was best for this location; to opaque. 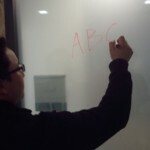 So we did some research and consulting with our film manufacturer, and found out they have worked with Expo markers�to make a specialized Clear Dry Erase film. This is where it gets cool. We found a perfect frost film and had it laminated to the dry erase film. Result? 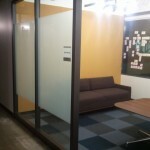 Dual Purpose Film providing privacy and a dry erase surface�= Happy Tenant = Happy Contractor.